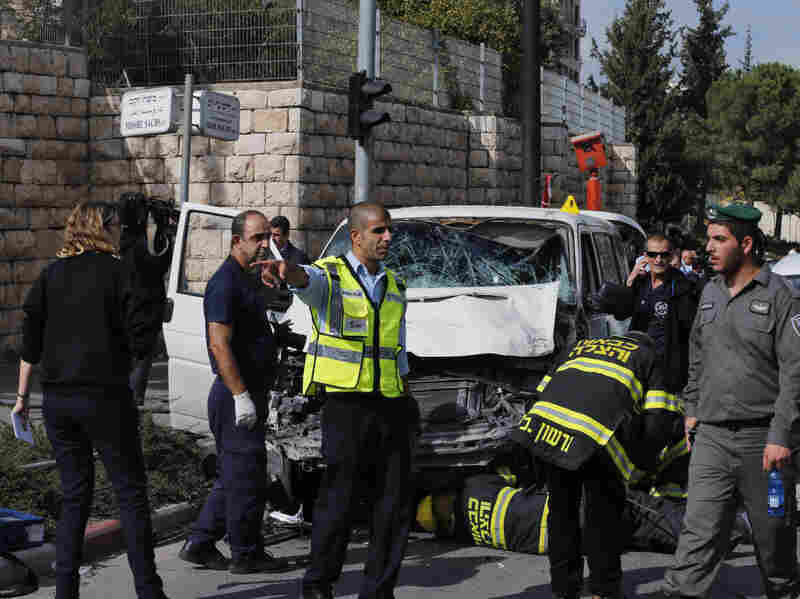 Palestinian Slams Minivan Into Pedestrians In Jerusalem Attack : The Two-Way One person was killed and 13 were wounded. Police shot and killed the driver who left his auto and began attacking people with a metal rod. Israel described the incident as a terrorist attack. An Israeli police officer gestures in front of the vehicle of a Palestinian motorist who rammed into pedestrians in Jerusalem on Wednesday. A Palestinian man drove a minivan into a crowd of pedestrians in East Jerusalem today, killing one person and wounding at least 13 before he was shot dead by police. Israeli officials described the incident as a terrorist attack. The militant group Hamas claimed responsibility for what it called a "heroic operation." Israel's Haaretz newspaper identified the Palestinian as Ibrahim al-Akari, a resident of East Jerusalem. He had recently been freed from prison where he had served time for security offenses. Akari, Hamas said, is the brother of one of the Palestinians released in exchange for Israeli soldier Gilad Shalit, who spent five year in captivity in the Hamas-run Gaza Strip. "According to rescue unit head Eli Bir, who was one of the first on the scene, the vehicle hit several pedestrians on Highway 1, at a bus stop on the corner of Shimon Hatzadik Street, then continued on to the next junction, at Moshe Zaks Street, where it ploughed into more pedestrians. The driver then exited the vehicle and began attacking people with a metal rod, before being shot and killed by police." Internal Security Minister Yitzhak Aharonovich called the attack "a road incident with a terrorist purpose." It was the second such incident near a light-rail station in Jerusalem. Last month, a Palestinian drove his car into passengers alighting the train, killing two people and wounding six others. The attacks come amid a backdrop of tensions in Jerusalem. Last month, a Palestinian gunman shot and wounded a right-wing Jewish activist who wants Jews to be able to pray at the Temple Mount. Police later shot and killed the gunman. The Temple Mount compound houses Al-Aqsa mosque, Islam's third-holiest site. Jews consider the Temple Mount sacred because it once housed the First and Second Temples. Jews can visit the site but cannot pray there. The Associated Press adds that earlier today "Israeli police had dispersed dozens of masked Palestinians who threw rocks and firecrackers near a contested holy site in Jerusalem's Old City."